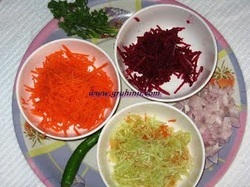 Grate cucumber, carrot and beetroot. Chop finely tomatoes, onions, green chilies and coriander leaves. Mix all veggies in a bowl. Add salt and pepper and toss until everything is uniformly mixed. Squeeze lemon and mix mustard oil.